You must sign into your myHangout account in order to contact Adam Kiesling. I just recently wrapped up a two-year long recording project. When I started, I really didn't have a clear vision of what I wanted to do, other than the fact that I wanted to record a solo album. It turned out to be a pretty interesting process. I recorded it in Dakota Dave Hull's Arabica studio, which resides in his basement, so I was able to record for an hour or two after work or for a few hours on a Saturday morning. I'd play around with an arrangement of a tune, record it, listen to it, and mess around with it some more. It was definitely a low-key approach, and one I probably wouldn't have undertaken had I booked eight hour blocks of time at a studio. I was also learning "how" to play in a studio, even though I had previously participated in a couple of different recording projects. This was my first time as a solo outing, and it took me a while to get comfortable. Dave and I would also shoot around ideas for songs and arrangements, and the final vision for the project started to gel around halfway through the two-year process. Dave's a pretty busy musician, and I've been out more and more on the road myself, so part of the reason it took a while is that our schedules didn't always line up. It'd also take a little bit of foresight to figure out times for rehearsing with the guest musicians and when it'd work for them to make their way to the basement. Guest musicians who joined me on the record are Gary Powell on the Hawaiian guitar, Meghan Dudle and Colin Harris on the fiddle, Liz Draper on the upright bass, Eric Lind on the banjo, and Dakota Dave Hull on the baritone National guitar. You can take a listen to the album at my bandcamp site. Adam Kiesling has 39 friends. View entire friends list. I started playing bass in high school, and then started playing acoustic guitar around the age of twenty. 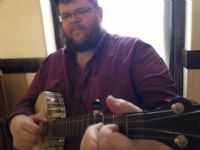 I got into old-time music in a big way around 2001 or so, and later started playing clawhamme banjor. I play guitar in an old-time trio, The Mill City Grinders.